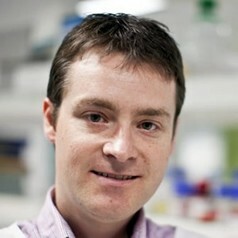 Dr McCarroll is a Project Leader in the Tumour Biology and Targeting Program at the Children’s Cancer Institute and the Australian Centre for NanoMedicine, UNSW. Dr McCarroll completed his PhD in 2005 at UNSW and joined the University of Massachusetts Medical School, USA for post-doctoral studies (2005-07). During this time he gained experience in using cutting-edge technologies to develop RNA interference (RNAi) agents and nanotechnology as therapeutics to treat human disease. - identifying new drug targets using RNAi in childhood (neuroblastoma, brain cancer) and adult (lung, pancreatic) cancers. - designing nanomaterials which can encapsulate high amounts of therapeutic drugs and deliver them to cancer cells. - examining the therapeutic potential of novel nanomedicines in preclinical in vitro and in vivo cancer models. - identifying new therapeutic gene targets using RNAi library screens to inhibit lung cancer growth.